Equipalazone There is 1 product. Equipalazone is the trade name for a drug called Phenylbutazone. Some people refer to equipalazone as ‘Bute’. 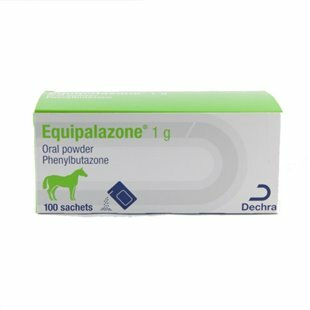 Equipalazone ?is licensed for use in horses and is categorised in the UK as a POM-V or prescription-only medicine. This means that there are special regulations concerning the supply of this medication. For this reason, we must receive a prescription from your equine Vet before being able to dispense the medication. Equipalazone or bute falls under a category of medicines known as non-steroidal anti-inflammatory drugs, or NSAIDs. NSAIDs work by blocking the production of chemicals known as prostaglandins. Prostaglandins are actually essential for the health and well-being of all horses as they promote blood clotting mechanisms (through their influence on platelet function), kidney function (prostaglandins can increase the blood flow to the kidney) and protect the gastro-intestinal system. These protective prostaglandins are produced by an enzyme called cyclooxygenase 1 (or COX-1). However, another role that prostaglandins have is to cause pain, inflammation and fever (a higher than normal body temperature). It is these, less desirable prostaglandins (produced by the cyclooxygenase 2 or COX-2 pathway) that cause discomfort and distress for horses and the aim of equipalazone or bute is to reduce this pain, fever and inflammation. What is Equipalazone used for? Equipalazone is licensed in horses to treat painful and inflammatory conditions affecting the muscles and soft-tissues, bones and joints. Bute can also be given following an operation where the surgery is anticipated to reduce pain and discomfort and is useful in the management of certain types of colic (abdominal pain). Probably the most common reason horses are started on Equipalazone is for degenerative joint disease, such as Osteoarthritits in horses (Arthritis in Horses). Arthritis is a disease that can affect any joint and happens as a result of normal forces being loaded through an abnormal joint, or due to abnormal forces being transmitted through a normal joint. For example, horses that have been used for intensive riding and jumping throughout their life, will often develop symptoms of arthritis in their hocks, something referred to as bone spavin. Horses can also commonly develop arthritis in their fetlocks, pastern and coffin joints, and less commonly in their stifles and spine. Osteoarthritis is an inflammatory disease and occurs when there is degeneration of cartilage and bone. This causes the formation of new boney protrusions and these spurs of new bone are called ostophytes. It is the combination of inflammation and irregular new bone formation that causes arthritic pain. Symptoms of arthritis can include lameness, reduced performance, changes in behaviour and sometimes swollen joints. The diagnosis of arthritis is often made through an examination by a vet and XRAYs are a useful tool to demonstrate the presence of boney resorption and osteophytosis. Equipalazone is also often used for inflammatory conditions involving soft tissues such as muscle, tendons and ligaments. Laminitis, an extremely painful condition causing foot pain is also often effectively managed using equipalazone. Often through a combination of rest and bute, soft tissue injuries can be allowed to heal and many horses are able to resume a healthy working life. Equipalazone can be administered by injection, usually directly into the jugular vein, but can also be given orally. Equipalazone is available in 1g powder sachets, and also as 1g pastes. The powders are usually mixed with food before being fed to horses and the pastes can be placed directly into the horses’ mouth.